To add to the grandeur of a cathedral wedding, a formal black-tie dinner, or, reflective meditation, Arisa can create that crowning touch of elegance to your special occasion. “... Arisa has the innate ability to work within, what I call, ‘warm chords’ and again to portray that warmth in her performance. 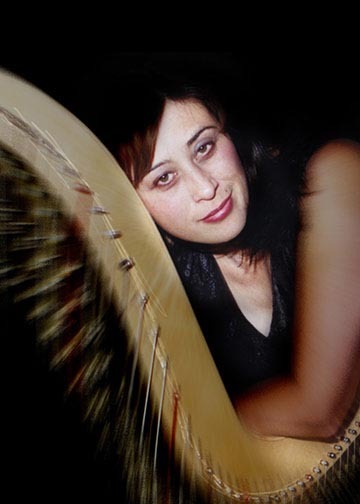 Arisa Houston has been a musician nearly all her life and has been playing the Harp for over 20 years. Her music studies began at the age of nine when she began studying the violin via private lessons and also played in the Kent Meridian Junior High School orchestra. Under the guidance of Mr. Turley, the orchestra won many musical competitions. Because of her affinity with strings, she began studying the harp as an adult with the late Edith Lundgren, a former member of the Seattle Symphony. During these five years under Mrs. Lundgren’s tutelage, she learned a very natural, relaxed, pedal harp style, which focused on a repertoire of standards from the 1930’s to the 1950’s as well as jazz chords and runs. As Arisa progressed over the years, her venues included weddings, receptions, special occasions, cruise ship entertainment, restaurant and hotel gigs, guided meditations, memorial services, “Relay for Life” ceremonies, etc. Some of the highlights of her musical career include playing the Seattle Kingdome for Microsoft`s annual company party with Bill Gates, and cruising the Inside Passage to Alaska with Celebrity Cruises playing nightly in the "Stratosphere Lounge". The most magical locations have included 12th century churches in South West England. The most exotic venue could be the Hyatt Hotel in Waikolola, or the Painted Church in Honaunau, Hawaii. While residing in England in the mid-1990’s, she began studying music with Far Haines, a guitarist, vocalist and music arranger for the Beatles. Under Far’s guidance her music theory and chord knowledge was enriched. To add to the uniqueness of this education, nearly every day, she would find in her mailbox, a musical arrangement by Far. Later, she would practice that arrangement on the harp backed by Far on guitar. It was one of the most rewarding and fun experiences of her musical education.